Chicago's busy roads are shared by passenger cars and semi-trucks. If truck cargo is improperly secured and falls in front of oncoming traffic, the resulting accident can be catastrophic or even fatal. How Are Trucks Required to Secure Their Cargo in Illinois? State and federal traffic safety laws regulate how all cargo should be distributed and secured. Drivers are required to check on their cargo and make any adjustments necessary. Driver and their trucking companies have to duty to ensure that there are no defects in the containers in which cargo is transported. Failure to follow these guidelines can result in accidents due to falling objects from a truck. Trucks carry a variety of materials, from food and housewares to heavy construction materials such as lumber, steel beams, cement bricks. Regardless of the material, any falling debris can severely damage a vehicle and cause catastrophic accidents. Even something small falling from a truck can distract a driver enough to cause an accident. If an object falls from a truck, the owner and operator may be held liable for injuries or property damage. If cargo was not properly secured, a person who was injured in a resulting accident may be able to collect damages under the theory of negligence. Do I Have the Duty to Avoid Falling Debris? The driver of a vehicle does not have the duty to take precautions to avoid an accident caused by debris falling from the truck, provided that there was no warning that the truck's load was in danger of falling. 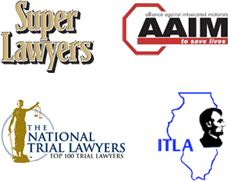 Nonetheless, it is important to speak with an experienced Chicago truck accident attorney in order to ensure your rights are being protected in your accident claim. Negligence claims against a truck driver or trucking company in the case of falling debris may be difficult to prove. However, there are steps that can be taken to investigate how the accident occurred. Some trucking companies utilize electronic data event recorders to record information about the truck and its operation. Truck drivers may also be required to log their activities. Nemeroff Law Offices can collect the necessary information from any electronic equipment or log books used to track a semi-truck's activities, as well as send accident reconstructionists to investigate the cause of your accident. Additionally, because trucking companies often place unrealistic expectations on their drivers and require that they work long hours in order to remain profitable. Your trucking accident attorney from Nemeroff Law Offices will investigate the company to determine whether or not an unreasonable schedule led to driver fatigue, which could have resulted in the improper securing of the truck's cargo. We offer a free consultation to evaluate your truck debris accident claim. It will cost you nothing to consult with a lawyer to see if you have a case. In trucker fatigue accident claims, the truck driver or the trucking company may be held responsible for damages. It is essential that action be taken promptly to preserve evidence, investigate the accident and/or conduct in question and to file a lawsuit, when necessary prior to a deadline imposed by the statute of limitations.